J. Alfred Prufrock measured out his life in coffee spoons. This month, the Canberran measured out its life in coffee miles – travelling serious distances in the pursuit of the black + white beverage. 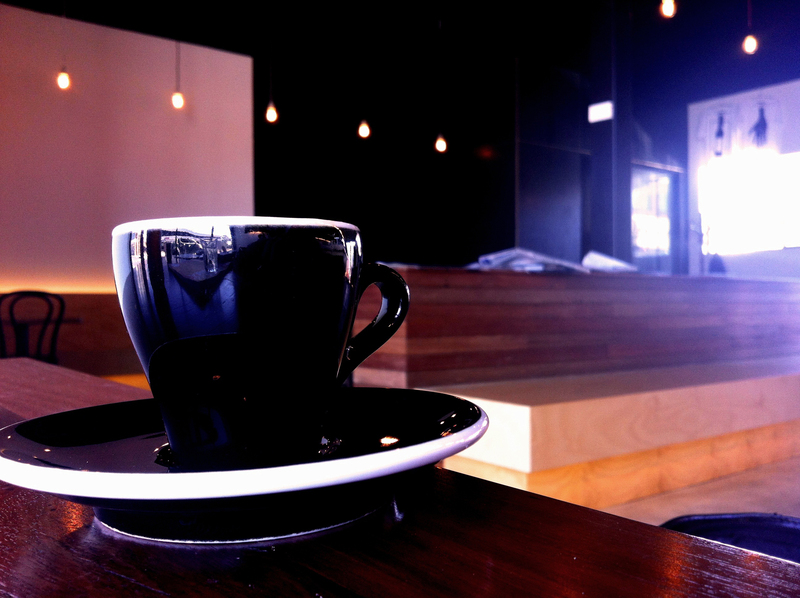 We took Cotter Rd to Weston, and Yamba Drive to Phillip, to try out the apparently-so-hot-right-now Lava Espresso. And try it we did — once, twice, and a third time (for pictures). Weston (Weston Creek?) is a funny kind of town. We’re going to go ahead and call it a town – it has the kind of country towny main street that Canberra ‘Shops’ just can’t emulate. And, from memory, less roundabouts? For trip one, we’re in Cooleman Court (cool, man), and we park behind a row of bright green shopping trolleys. Across the road, there’s a Laksa house, a real estate agent, a hairdresser, a splash of red, and a billboard that promises coffee. The Lava java flows (see what we did there?) in a honey-coloured wooden bunker with honey-coloured furniture – vaguely reminiscent of Tatooine, Star Wars ep 1. A red drop-lit counter vaguely invites approach, and framed posters vaguely advertise gigs. The Greeting is from a young un’ with seriously dirty hands, probably from riding his Uncle’s speeder all over the desert planet. After The Order, we park in the front window, unlocal and exposed. We warm to Lava, literally, as morning sun pours in through glass, unobstructed by trees or by high rise. The People and The Staff have incredible rapport. Every patron appears to be a regular, or a local tradesperson, and small talk lives large (The Waitress was going to a Ball that night). The Owner-type compares short blacks, munching sourdough. Our short black is a bit of a pucker-fest. We suspect it’s just that millisecond overrun. The Long (flat white) is delivered cheerily, fronded and fair. Locals load up on larges, and leave with smiles. We leave with that behind-eyes coffee buzz, and smell an ‘institution’ in the brewing. The more photogenic Lava is in Phillip, less West, more Woden (this is a ‘burb, baby). The Fyshwick of the South scatters services through cavernous ‘courts’: ring roads studded with op shops, spice shops, tyre shops, music shops. Some of them are thriving, some of them are long since closed – it’s hard to tell, and it’s hard to navigate. Townshend Street feels wide, desolate and road-to-nowhere. We park in Colbee Court and trot across the non-traffic, feeling very why-are-we-here-on-Saturday. Inside the plate glass, conformity with the whole ‘industrial’ trend cuts costs on The Decor. Cool hits you like a wet fish to the face. The Vibe is Chilled. Chilled house music, chilly concrete underfoot, chilled spacey tables and chilled-out dudes behind the counter. Billboard genius by jessmessdesign is the shining chalk-light behind baristas. The Hipster Factor is High. After a little ‘where to perch’ panic, we settle on giant communal front table. The view is amusingly proletariat, and no one’s in a hurry on Saturdays in Phillip. The Short is first up to bat, and we’re shooting fireworks out of our ears – it’s cushioned by thick crema, all caramel coloured, not-at-all crispy. With a berry-tinted explosion in each sip, it’s the first brag-worthy Short of our Canberracquaintance. Ecstatic, we take time to explore The Sides – well-priced bread-based classics – and eavesdrop as The Manager-Type lackadaisically interviews a prospective waitress. The Long is a Cheshire-cat grinning Flat White. It follows quickly, and looks so fine on scattered newspapers that we pose it for pictures immediately. The Long tastes as good as it looks: a lukewarm, smooth maltmouth. With the right amount of feather-light foam, it’s friendly but not fierce. By this beauty, a breadcrumbs’ throw from timewarpy tea-room ‘Hansel and Gretel’, we’re as surprised as a witch pushed into a gingerbread oven, or something. 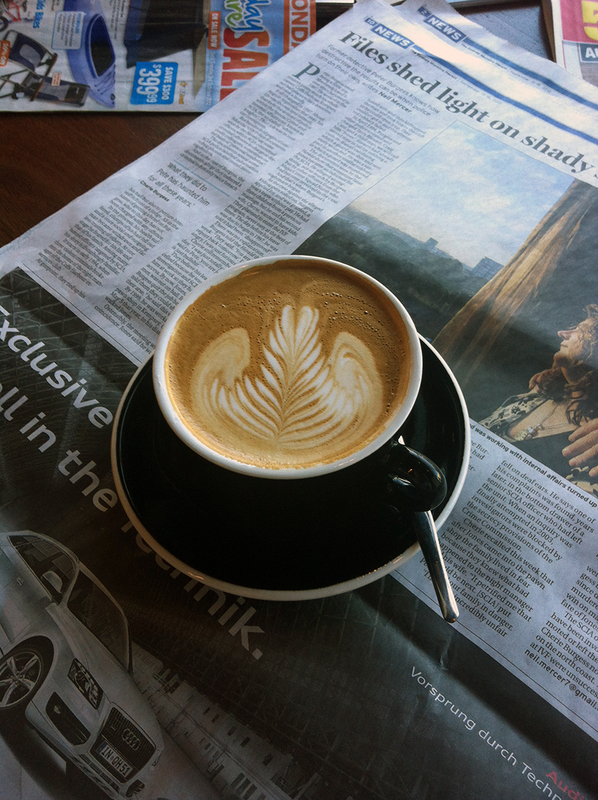 The Latte Word: If you’re down Woden way, we can’t think of anywhere else you’d go for cups of joe. Careful carbon dating* suggests that Lava (Weston) is around two years old, and we’d say two years well spent, cultivating the cult art of coffee. David Letterman said if it weren’t for the coffee, he’d have no identifiable personality whatsoever. 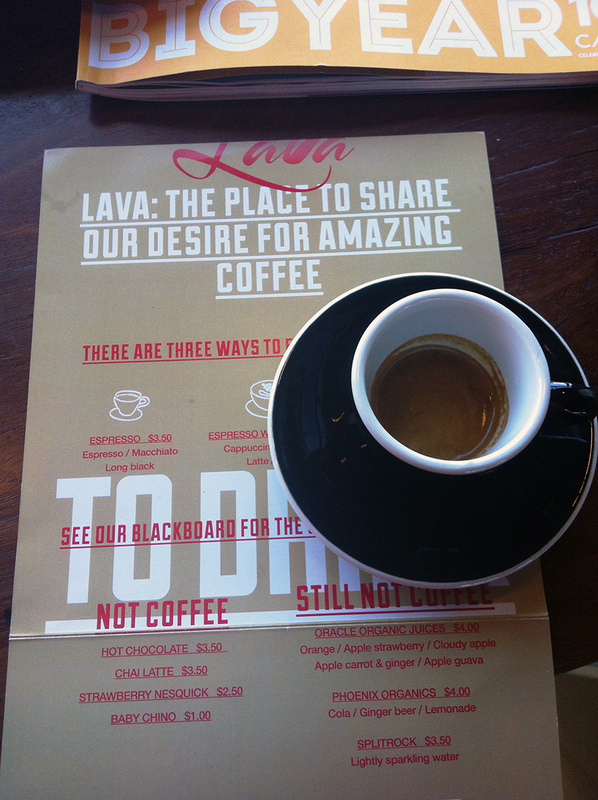 At Lava x 2, the coffee is enough. I found Lava at Weston last year. The Phillip store has been a long time coming, but worth the wait. In a city with few really decent coffee shops, as you say, you can find fantastic coffee at both locales. I have been to Lava Weston Creek and I like it. It’s bizarre but refreshing to find a little outpost of “cool” coffee culture in the WC ghetto. I also noticed the nice relationships between staff and regulars. I am intrigued to try the Philip store.